Learn how to make a little white butterfly hanging decoration from metal wire and gemstone beads. All the materials you need are in the box. 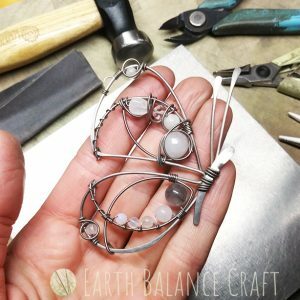 Learn basic wire work techniques to help kick start your new wire-work hobby. 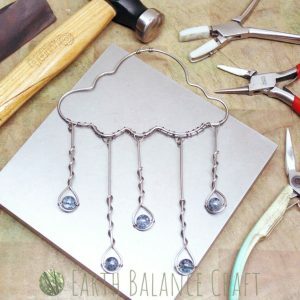 This craft kit is suited to those who own the wire working tools already and only need the materials and tutorial to make the design. Learn to make a pretty wire work heart decoration from titanium, semi-precious gemstone & glass beads. The colour palette is called ‘Wild Rose’, inspired by the rambling English rose wild-flower. This starter kit is the ‘material supplies’ version, for those who own the wire working tools and equipment already. This box provides the beads, wire, tutorial and template to learn to make the design. 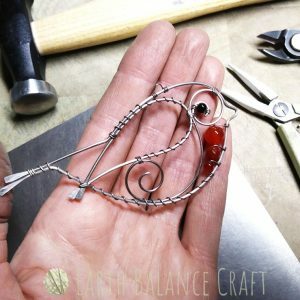 Learn to make this little robin red breast hanging ornament using titanium metal wire and gemstone beads. This box is the ‘materials only’ version, providing the materials needed to make this pretty bird. This starter kit would suit someone who already owns a set of wire-working tools and equipment and would like to try out a new wire wrapping project. Give the gift of creativity with this easy to use hobby kit.